As I recently read the article about Ancient India and our amazingly sensual and lurid past, I really couldn’t help but marvel at the state of LOVE affairs in India. India indeed has a very licentious relationship with sensuality. We pride ourselves for authoring the Kamasutra, which details descriptions of every form of sexual union imaginable between man-woman, woman-woman, man-man. We built temples in Khajuraho, which detailed sculptures of graphic sexual scenes between multiple men and women, men and beast. We built Mirror Palaces (Sheeh Mahal) so queens and kings could romp in their bedrooms looking at the ceilings above. We bow to the “ling” of Shiva and Parvati in temples even today, which by the way represents male and female fertility organs…if you know what I mean. We love our women in Saris, which exposes their entire abdomen. Yet, we find the whole concept of public display of affection, holding hands, giving a little peck on the lover’s cheek a bit…weird and untraditional. For those who have traveled to India, ask yourself this – have you ever seen couples comfortably and genuinely hold hands, and express physical affection and love? How Did We Get So Ultraconservative? Self appointed experts state that we have been enslaved by many – the Mughals or Persian rulers who invaded India around 1500s, and the British who ruled India around 1700s. Different dynasties brought with them varied cultures and traditions, and managed to dilute the free-spirited ancient Indian culture. Others place blame on the eventual decline of the Indian culture, which became increasingly intolerant towards women after introduction of the dowry system, the sati system and so on. The once fluid caste system based solely on one’s current profession, became rigid where people rarely married between castes and social class. Over thousands of years, what resulted was a conservative approach to love. Love-marriages were frowned up, and majority of marriages were arranged by parents based on profession, education, family background and general life interests. Most of our parents concurred to an arranged-marriage where they barely met their partner before getting married. You ask, how can you marry someone you don’t know? The ultraconservative yet philosophical Indian answer is – can you really ever know anyone? While these root causes are critical in shaping our ultra-conservative approach to love, recent developments in the Indian culture have not helped either. Shiv-Sena activists have single handedly taken it upon themselves to make the youth aware about Indian culture. And their version dictates – no Valentine’s Day! After all it’s a Western celebration. 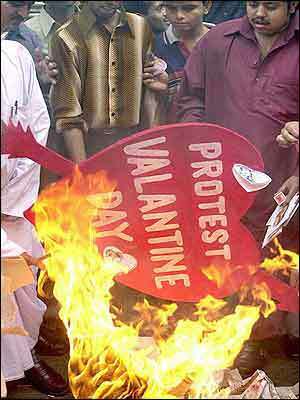 Recent reports about Shiv-Sena activists conducting raids in restaurants, hotels rooms, theatres etc without permission are enough to rattle any lover expressing love on Valentine’s Day. Even the banks of the Holy river Ganges in Varanasi will not be spared. Lovers planning on gathering to pray for their eventual love-marriage to materialize, will have to wait for a few days before Lord Kamadeva blesses them again. Inter-caste alliances still manage to draw savage wrath of the ultraconservative guardians of Indian culture. Free-wheeling, self-appointed and anti-constitutional institutions like the Khaap have been known to order the execution of lovers who dare marry outside community confines. Risking life for love sounds romantic, but it might give the best of us jitters! In fact, it is safe to say that the inter-caste marriages haven’t really taken off in India as well as they should have. A majority of inter-caste marriages in India happen between the educated, well-to-do Indians who have moved on from parental and cultural diktats. Sorry to offend you, but we really don’t! We preach modesty for youth – no boyfriends, no jeans, no chowmein, no intercaste marriages, no western influence…period! This is the same country that celebrated women like Draupadi, who took 5 Princes as her husbands. This is the same country that revered celestial nymphs as powerhouses of love, sensuality and beauty. This is the same country that gave the World the first comprehensive book (Kamasutra) about love-making, when the rest of the World was in dark ages. But sadly, we have grown into a culture that frowns upon basics of love – including Valentine’s Day! So why not return to our traditional roots and celebrate what India was truly about, a country with freedom of self-expression, freedom to select our love partners, freedom to explore love emotionally and physically, and freedom to celebrate national and international festivals such as Valentine’s Day, Rose Day and what have you. Heres’s a warm Valentine’s Day wishes to all our readers! Thanks so much for your thoughtful comment. I feel like India has some of the most progressive things to offer if we would just stop regressing socially. Please feel free to share the article with your friends and thanks so much for your support! Love your blog by the way…the pics are lovely! Absolutely in love with this post!! It is really interesting to see how the Indian culture has evolved!! Previous Previous post: Inspiring Quotes – Motivating quote for the day!